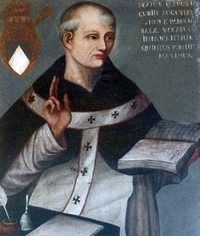 Peter of Tarentaise was barely 10 years old when he was admitted to the Dominican Order by Blessed Jordan of Saxony as a boy-novice and sent to Paris to study. Like Saint Thomas Aquinas, Blessed Ambrose of Siena, and other luminaries of the 13th century, he fell under the masterly tutelage of Saint Albert the Great. He received his master’s degree in theology in 1259, then he taught for some years in Paris, where he contributed a great deal to the order’s reputation for learning. He wrote a number of commentaries on Scripture and the Commentary on the Sentences of Peter Lombard, but he devoted most of his time to the classroom. He soon became famous as a preacher and theologian, and in 1259, with a committee including his friend Thomas Aquinas, composed a plan of study that is still the basis of Dominican teaching. At age 37, Peter began the long years of responsibility in the various offices he was to hold in his lifetime as prior provincial of France. He visited on foot all Dominican houses under his care, and was then sent to Paris to replace Thomas Aquinas at the University of Paris. Twice provincial, he was chosen archbishop of Lyons in 1272 and administered the affairs of the diocese for some time, though he was never actually consecrated for that see. The next year Peter was appointed cardinal-archbishop of Ostia, Italy, while still administering the see of Lyons. With the great Franciscan, Saint Bonaventure, assumed much of the labor of the Council of Lyons to which Saint Thomas was hastening at the time of his death. To the problems of clerical reform and the healing of the Greek schism the two gifted friars devoted their finest talents. Before the council was over, Bonaventure died, and Peter of Tarentaise preached the funeral panegyric. In January 1276, Peter was with Blessed Pope Gregory X when the latter died at Arezzo. The conclave was held in the following month. On January 21, 1276, Peter of Tarentaise received every vote except his own. With a sad heart, he left the seclusion of his religious home to ascend the Fisherman’s Throne as Pope Innocent V.
The reign of the new pope, which promised so much to a harassed people, was to be very brief. But, imbued with the spirit of the early apostles, he crowded a lifetime into the short space given him. He instigated a new crusade against the Saracens and began reforms in the matter of regular observance. He actually succeeded in solving many of the questions of the Greek schism and in establishing a short-lived truce. He struggled to reconcile the Guelphs and Ghibellines, restored peace between Pisa and Lucca, and acted as mediator between Rudolph of Hapsburg and Charles of Anjou. He restored the custom of personally assisting at choral functions with the canons of the Lateran, and he inspired all with the love that animated his heart. Had the measures begun by Innocent V had time to be fully realized, he might have accomplished great good for the Church; he did at least open the way for those who were to follow him. Death stopped the hand of the zealous pope when he had reigned only five months. Like his friends Saint Thomas and Saint Bonaventure, he was untouched by the honors and dignity with which he had been favored, and death found him exactly what he had been for more than 40 years–a simple, humble friar.